We’d love your help. 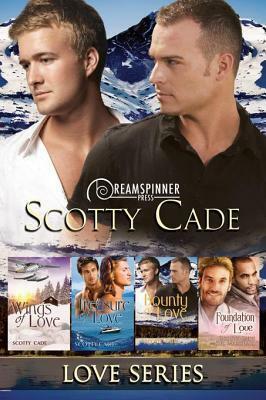 Let us know what’s wrong with this preview of Love Series by Scotty Cade. In Wings of Love, Dr. Bradford Mitchell flees to Alaska to escape the devastating memories of his deceased partner, but can he let go of the past soon enough to embrace a future with pilot and friend Mac Cleary? In Treasure of Love, dive master and charter boat captain Jackson Cameron finds himself questioning his sexuality when openly gay treasure hunter Dax Powers hires him, but if they want to keep their new-found treasure, they'll have to fight to keep the crew safe. In Bounty of Love, Zander Walsh wakes up from coma only to find his fiance and parents dead in an apparent robbery gone wrong. FBI Agent Jake Elliot is doing his best to find the murderer, but as the months pass-and unexpected feelings grow between them-it becomes clear that someone is doing their best to keep them from finding the truth. Finally, in Foundation of Love, co-written with Z.B. Marshall, Wes Stanhope has spent years running from his father's controlling ways, but when his mother dies, leaving behind one last wish, he finds himself back under his thumb. His attraction to architect Ty Williams-and Ty's refusal to hide in the closet-just might be enough to make him fight back. To ask other readers questions about Love Series, please sign up. Overall, this book scored 3/5 stars for me. I liked it well enough, but there were elements that were really dragging me down. One of those consistent elements being direct narration from the MC's, and I have no patience for that. However, I really did like some of the characters. Since it was a series bundle, I reviewed them each separately, because unfortunately, not all books are created equal. I tried. I really did. I wanted to like this story, but it tore me to pieces. Not Overall, this book scored 3/5 stars for me. I liked it well enough, but there were elements that were really dragging me down. One of those consistent elements being direct narration from the MC's, and I have no patience for that. However, I really did like some of the characters. Since it was a series bundle, I reviewed them each separately, because unfortunately, not all books are created equal. I tried. I really did. I wanted to like this story, but it tore me to pieces. Not only did the MC's narrate the book and TELL me what was happening, but I also just didn't really like the story. Allow me to explain. This story takes place in Alaska at what is apparently a remote lodge. I may be wrong, but it appears to me (based on this story) that Scotty Cade has never been to Alaska. I live in Alaska. See the problem? I think when people are intimately familiar with elements that an author is writing about, it makes the story ten times harder to sell, and this one just didn't do it for me. The Alaska that Cade wrote about in this book is not the Alaska I know and it just fell short for me. However, for anyone who hasn't been to Alaska or who doesn't know much about Alaska, it's probably not going to bother you and you might not even notice. So, personal opinions. For the positives, I really liked Bradford's backstory. He experienced tremendous loss and Cade writes about that very well. Even though Bradford was moving forward and trying to get past that point in his life, it was still very much a part of him and he was still learning to deal with the loss and give himself permission to move on and be happy again. Even though I think Mac and Bradford could've been a good match, I think their romance was rushed and I just couldn't connect with them. Tremendous improvement from the last book. Maybe because I don't know anything about treasure hunting? In any case, I found myself less judgemental of this book. I really liked both Jackson and Dax (though Dax was my favorite). One of the best things about this book was how openly gay Dax was. There were parts that almost made me want to laugh because it seemed comical, like a skit made for a cartoon. "The Adventures of Captain Cameron and the Gay Teasure Hunter." I can see it now. In all seriousness, though, I did like this book much much more than the last. I felt like there was a real connection between Dax and Jackson. Even though the book did still feel rushed, it felt like it had been reviewed and edited more than the first, or maybe the author just improved their writing that much between the first and second books (which would be worthy of a standing ovation, whoa). Whereas the first book was "meh," this book was "good." I'm a sucker for tragedy. I'm sorry. Don't let my affinity for sadness mislead you. Anytime I get a good book with a really great or emotionally charged backstory, that translates into bonus points, which, at the end of the day, translates into bonus stars. I'll be honest, this book was similar to the first book. It was "good." There was room for improvement, but I liked Zander and Jake. Even more, I liked them together. Their story was less rushed and they had some chemistry working for them. But the backstory in this book, whoa. Knowing the history made everything feel much more emotionally charged. I also felt like the characters were much more fleshed out and consistent, probably because of the backstory. This was my favorite of the three books, by far. This one was also really good! I liked Wes and Ty and I appreciated that the conflict in this book was minor and more centered around the two MC's instead of focusing so much on the adventure in the story. This book also had a strong backstory, but it didn't leave me feeling emotionally raw like Bounty of Love did. I liked the spirit of these characters. Wes, in particular. He was confused and not quite sure of himself, still floating around in the world, trying to figure out who he is as a person now that his mother is gone (which is a shocking and difficult thing for anyone to work through), and even though he's attracted to Ty and he knows deep down that he could have something great with him, he's scared. But instead of letting that fear control him, he overcomes it. He pushes it down and learns to stand up for himself and be his own biggest fan. I love books where characters are learning to find themselves and somehow find love along the way. This was one of those books. Even though I think this book was written the best, I still liked Bounty of Love more because of the strong backstory. What an amzing series about finding ones self, accepting ones self, starting over, giving love a chance and finding love again after loss. Scotty Cade did an amazing job on this series. It is one of those series that grabs ahold of your heart and keeps you reading each book to the very end. Scotty did an amzing job of incorporating so many different emotions into this series. There is grief over losing a loved one, there is struggle over accepting ones sexuality, there is danger, there is hate, t What an amzing series about finding ones self, accepting ones self, starting over, giving love a chance and finding love again after loss. Scotty Cade did an amazing job on this series. It is one of those series that grabs ahold of your heart and keeps you reading each book to the very end. Scotty did an amzing job of incorporating so many different emotions into this series. There is grief over losing a loved one, there is struggle over accepting ones sexuality, there is danger, there is hate, there is murder, there is acceptance, and above all there is love.....lots of love. These books are all connected to one another in one way or another. The group of men that Hess books are about are either friends previously or are brought into the group by one or more of the men. The men that are the main instigators in these books in my opinion is Mac and Brad. Though they have their own book and how the two came together, Mac and Brad seem to appear in each of the books and somehow have a hand in one way or another with helping the other couples come together. If you are looking for a good read that has a little bit of everything you could be looking for in a series that will hold your attention, then this is the series for you. I truly enjoyed this series and so glad that I got the chance to be able to read i. It was truly an amazing read. Scotty Cade left Corporate America and twenty-five years of Marketing and Public Relations behind to buy an Inn & Restaurant on the island of Martha’s Vineyard with his partner of over twenty years. He started writing stories as soon as he could read, but just five years ago for publication. When not at the Inn, you can find him on the bow of his boat writing gay romance novels with his Shetla Scotty Cade left Corporate America and twenty-five years of Marketing and Public Relations behind to buy an Inn & Restaurant on the island of Martha’s Vineyard with his partner of over twenty years. He started writing stories as soon as he could read, but just five years ago for publication. When not at the Inn, you can find him on the bow of his boat writing gay romance novels with his Shetland sheepdog Mavis at his side. Being from the south and a lover of commitment and fidelity, most of his characters find their way to long healthy relationships, however long it takes them to get there. He believes that in the end, the boy should always get the boy.